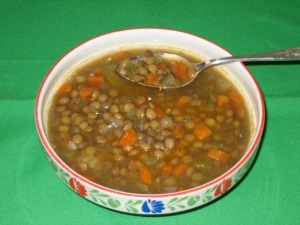 It’s no wonder that diet lentil soup is loved all over the world by millions of people. What’s not to love? It is a warm and tasty meal that is extremely filling, inexpensive to make and has an endless list of health benefits. Many vegetarians rely on healthy meals like this for protein, but you don’t have to be a vegetarian to enjoy and reap the benefits of this hearty homemade soup. Lentils are seeds that come from the legume family. Simply this family is a group of flowering plants that have seed pods and when ripe can be harvested. The more popular legumes consumed are beans, lentils, peanuts, soybeans and peas. There are many different types of lentils but the most common are the red, brown or green. The green variety doesn’t get as mushy as the other kinds, which is why they are preferred in most recipes. In a large soup pot add olive oil and chopped onions and sauté on medium heat for about 5 minutes. Add garlic, carrots, celery and sauté an additional 5-7 minutes. Now add remaining ingredients including lentils, tomatoes, all liquid and spices. Increase the heat to high and bring ingredients to a boil. Reduce the heat to low, cover and cook at a low simmer for about 35-40 minutes or until lentils are tender. Tip: If you find the soup too thick just add some more broth or water until you achieve the consistency you desire. Want to add a garnish? Place a dollop of sour cream or yogurt on top to garnish. Then sprinkle the dollop with parsley or chopped green onions for added color. This truly is a homemade soup that gives you lots of good stuff.